A Fox News poll released on Wednesday shows incumbent Senator Mitch McConnell (R-KY) leading Democratic challenger Alison Lundergan Grimes by 4 points in the Kentucky U.S. Senate race. The poll was released a day before a huge gaffe by Grimes that NBC’s Chuck Todd says “disqualifies” her from serving in the Senate. What the polls don’t show is an ambitious Democratic ground game that targets “unlikely” but left-leaning voters and is manned by a “Rainbow Coalition” of young community organizers from elite colleges like New York University, Oberlin College, and Johns Hopkins University which could give Grimes an election day boost not captured in the latest polls. According to the most recent Federal Election Commission filings, the Kentucky Democratic Party Executive Central Committee had fifty young field organizers on staff as of August 31. Many of these staffers came from out-of-state or are current students or recent graduates of elite out-of-state universities. Republicans are betting that a majority of the voters in Kentucky will reject Grimes as a pro-Obama politician who will say anything to get elected. Democrats, in contrast, are betting that Grimes will be able to overcome her weaknesses by implementing, with the help of her party and labor union allies, the Democratic Senatorial Campaign Committee’s $60 million Bannock Street project in Kentucky. That project, named after the street in which Senator Michael Bennett’s (D-CO) successful 2010 upset victory was planned and managed in Colorado, focuses on building a technology driven ground game to identify and bring to the polls left-leaning but “unlikely” voters by delivering a narrative uniquely tailored to their concerns. Both candidates have raised and spent more than $10 million in what some predict may be the most expensive U.S. Senate race in history. But the money to run the Grimes ground game does not come from her campaign coffers. Instead, according to Federal Election Commission records, the Democratic Senatorial Campaign Committee had funneled at least $200,000 to the Kentucky Democratic Party by August 31 to recruit and hire its ground game warriors. While this number pales in comparison to the $2 million the DSCC had given to the Arkansas Democratic Party prior to August 31 to boost Senator Mark Pryor’s (D-AR) re-election campaign with a robust ground game, Federal Election Commission reports to be filed on Wednesday for the period ending September 30 may well indicate that the DSCC’s financial support for the ground game in Kentucky has increased significantly in the past month. A number of published reports indicate that this army of activists is steeped in the same Alinskyite community organizing principles that brought Barack Obama to power in 2008 and kept him there in 2012. Another example of the Grimes campaign’s culture of deception was on display last weekend, when dozens of young volunteers from the College Democrats of George Washington University drove down to Kentucky and knocked on 5,000 doors for Grimes in three days. Young students from elite out-of-state colleges aren’t the only ones pitching in to help Grimes get-out-the-vote. As Breitbart News reported on Wednesday, local offices of the Teamsters Union are being used as training grounds for volunteers. In addition, the AFL-CIO has already spent over $129,000 on get-out-the-vote efforts in Kentucky through its Working America PAC, and is expected to spend much more. Shuler spent last Tuesday and Wednesday visiting AFL-CIO facilities in Lexington, Lawrenceburg, and Frankfort. Public records offer little indication the McConnell campaign and the Republican Party of Kentucky are approaching the ground game with the same resources and energy shown by their opponents. 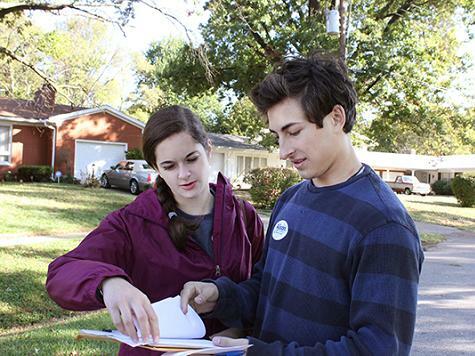 A review of FEC records indicates that the McConnell campaign paid a total of 40 volunteers for “canvassing” one to two weeks (payments ranged from $300 to $800 each) in May 2014 (the primary was on May 20), but no subsequent canvassing payments were found in June. In an exclusive interview with Breitbart News on Wednesday, Chris McNulty, the Republican National Committee’s Director of Political Operations and the former Deputy Executive Director for “Team Boehner” embedded with the National Republican Congressional Committee, said that the McConnell campaign is handling all its get-out-the-vote operations internally. Breitbart News attempted to confirm this information with the McConnell campaign, but received no response to our inquiries. Gus Herbert, who Calloway County Republican County Chairman Greg DeLancey told us was responsible for coordinating get-out-the-vote efforts for “McConnell and other Republicans” in eight western Kentucky counties in a region called “The Purchase,” confirmed to Breitbart News that he was a field coordinator employed by the Kentucky Republican Party, but referred us to the McConnell campaign for a further description of his activities. The RNC’s McNulty spoke glowingly of the Republican Party’s get-out-the-vote efforts in general, but was unable to provide any details about the McConnell campaign operations. A source familiar with the operations of the McConnell campaign said it has knocked on 500,000 doors, but there’s no public evidence to verify whether that is true.